York’s Theatre Royal has been undergoing major refurbishment, as most of us are probably aware. York Mix recently included photos of the remodelled interior. I haven’t been inside it, but passed the front of it on an evening wander a couple of weeks back. More on that later perhaps. For now, let’s focus on this glazed colonnade. Before the glazing was installed the arched openings at the front and sides gave access to a sheltered roofed area alongside the pavement and bus stops outside the theatre. It was handy if you were in a rush and the pavements in front were busy, as you could nip through the colonnade. Now it has café tables in it, and carpet on the floor, and if you try to dash through it on your way along St Leonard’s Place you’ll collide with the glazing. 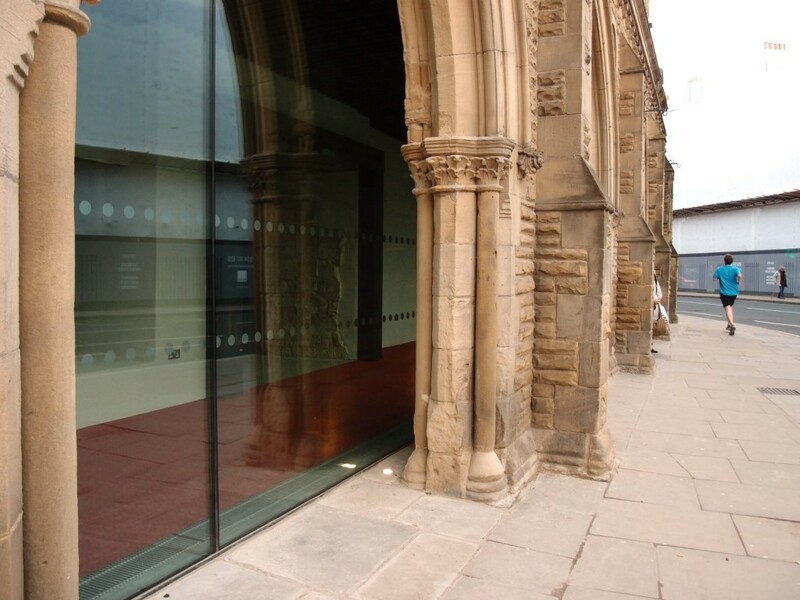 Some of the extra space has come from glazing and incorporating the Victorian gothic arched colonade, which used to serve as a shelter for the bus queues outside. It is hoped that instead they will now come in to buy coffees. Mmm. Reading this makes me feel a little bit uncomfortable. There are a several places a stone’s throw away where coffees can be bought. The city is full of them, in fact. If you’re into drinking coffee and eating out and enjoy going to the theatre and the art gallery then it’s all looking good. If you don’t have the money to do those things, and if you often catch a bus home from the outside the theatre, or indeed have no home to go to, then York seems a less friendly place. I’m getting that impression, seeing many examples of a divide, completely different experiences and perceptions of York and what it’s like to live here. These new glass walls in the theatre’s colonnade seemed to symbolise that somehow. The open Theatre Royal collonade,was once the trysting place,for meeting of boys meet girls,many years ago.One of the many meetings, was,my lass coming from Acomb to Exhibition Square,and me coming from Heworth,both buses dropping off there,and waiting out of the rain, in the theatre entrance.Then off to the pictures in town,or De grey Room dance,for wonderful evenings together.Not possible any more,Oh! Dear! I remember that prior to the last refurbishment of the Theatre Royal in 1967 the open collonade was then part of the original entrance to the theatre, and was enclosed as it is now again. Consideration though was given to theatre goers leaving, and bus passengers as there was an interesting glazed canopy attached to the front of the theatre. I seem to remember this was quite ornate with panels of stained glass at each end. This had probably been added in Victorian times. I have seen photographs of this structure over the years in various publications and articles. It is a pity that the council or architects of the new refurbishment had not thought to take this opportunity to consider the York public and construct a replica paying homage to the original canopy. Thanks for adding memories and recollections Stephen and David, always good to read your comments.